"When AMPK is overactivated from the very beginning of embryogenesis, we don't know what effects it's having on normal development," says Daniel Garcia, a senior research associate at Salk and first author of the new paper. "The model we've developed is much more similar to what you would see in a clinic if you target AMPK with drugs," says Garcia. Moreover, by double-engineering the inducible AMPK gene in the mice, the researchers can also control where in the body this AMPK activation happens—everywhere, or just in a select tissue or tissues. 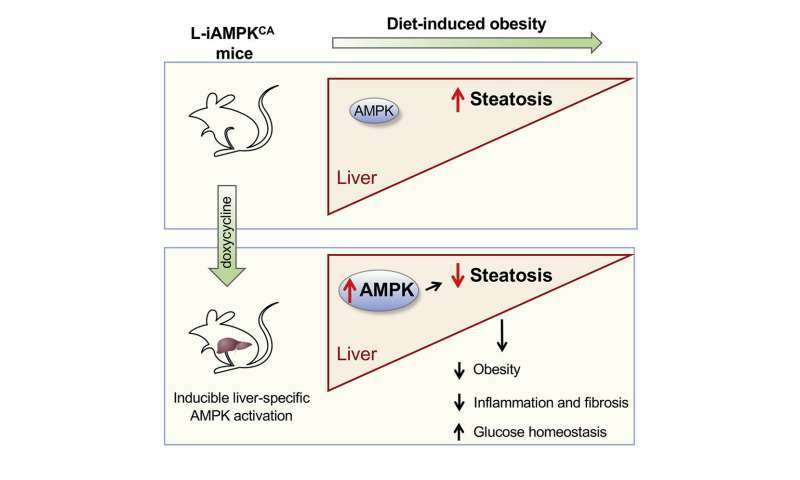 "This paper confirms that AMPK is a good target for treating NAFLD," says Garcia. "It's further confirmation that AMPK activators should be tested clinically." In addition to the effects on liver fat, AMPK activation—even though it was limited to the liver—also lowered levels of fats elsewhere in the body, suggesting that hormones released by the liver into the rest of the body were affected. "These results indicate that AMPK could potentially be a powerful treatment to a host of diseases in humans," says Shaw, who holds the William R. Brody Chair. Wow. ANOTHER solution to obesity that will never see the pharmacy. Yes. I'm a little skeptical and disappointed in so many breakthroughs and no solutions that come out of them.